This article refers to a speech I was kindly invited to give at the User Experience Day at Telekom Darmstadt at Nov. 22. It highlights in which extent the principles of ambient intelligence have the potential to support the idea of user experience. In our reception – at least from the perspective of the so-called digital natives – real and virtual world more and more merge. At the same time the technology today gives us the possibility to finally receive information and communication at anytime and anywhere, like it was announced since a long time. For the optimist’s ear those facts sound like preconditions for a perfect because of immersive user experience. And yes, in fact it is, apart from the bad habit of human beings not to be too tolerant towards abstract situations. This leads to the conclusion that there must be more offered than “anything, anywhere” for a satisfying user experience. On the basis of projects, made at the course “Ambient Environments” by Interactive Media Design students, possible approaches and scenarios are presented here as an inspiration for thought. Please find here a collection of the listed and further ambient media projects. Reality – What’s That Actually? As presented in my article “UX & Stories” during the last two decades, we experienced a paradigm shift in the reception of interactive media. Whilst we started to explain the “New Media” with known models of our then todays world in the 80s, we are today used to expand our reality by virtuality without any bewilderment or even noticing it. Looking back from a today’s perspective to the first commercial websites, it is almost heartwarming to see them imitating the real world to advertise the web offers as accessible as a walk through the mall. In 1996 the German Dresdner Bank consequently followed this approach. Meanwhile the situation changed completely. As the artist Aram Bartholl states in an interview for the German publisher gestalten: “What is online is real.”, we live in a constant symbiosis from the virtual and the physical. The example illustrated above shows the merge of the two experience-worlds game and reality. The names, written above the avatars in the game “World of Warcraft” are recognized and accepted in the real world. Digital interactive media slipped into our daily life during the times and we are ready to take them as a reality. Well, once you accepted that paradigm shift, looking at interactive media is like discovering a new planet in outer space where you can live at. What shall we do with that planet? Relocate and live at it? Send “the others” to it and stay at home? Bend it to your rules or discover those of the planet? But what does ambient media, ambient intelligence or ubiquitous computing mean? The EC Information Society Technologies Advisory Group (ISTAG) defined term Ambient Intelligence (AmI) as a vision of the Information Society. It emphasizes on user-friendliness, efficient services support, user-empowerment, and support for human interactions. It is closely related to the terms Ubiquitous Computing and Ubiquitous Communication. Both terms are coined by a more hardware-oriented approach of the US-research activities. Whereas Ubiquitous Computing means the integration of microprocessors into everyday objects, Ubiquitous Communication links these objects to communicate with each other and the user. A concept very close to those ideas is Pervasive Computing, which is the idea of industry. To make it even more confusing, the German Ministry for Economy and Technology claims the term Next Generation Media. The following chart describes the factors which convert interactive media into ambient intelligence. An ambient system is highly adaptable to the users’ needs. It knows the place and the circumstances of use given by the context of the user. This could mean for example, that a system knows that I am tending to compensate excessive meal consumption with sports. It might suggest to schedule a date in my time planning for an extra jogging tour, when I am booking a table at a restaurant. An ambient system recognizes and monitors the activities of a user and gives according information to the user or to other receivers. Following an example from the field of “ambient assisted living”, vital parameters and observed activities (or missing activities) are monitored and transferred to the family doctor or hospital to be ready to trigger medical help if necessary. I know that this sounds a bit like the frightening “big brother”, but if this helped me to live longer and self-determined in my own flat when I am old and dependent on medical care, I feel absolutely fine with that concept. Such a system last but not least is able to learn to adapt more and more to my needs autonomously. With these abilities, an ambient system is to a very high extent human centred. Also the way of interaction possibilities with an ambient system is better adjusted to the users’ needs. An ambient environment is often equipped with smart objects with haptic interfaces. If the system is a ubiquitous one that immaterially disappears in the environment, gesture interaction is possible. Last but not least, the system can interact directly with the human body by interpreting its data. Where Is UX In “Anytime” & “Anywhere”? We can state that we reached the long preached goal of media to be accessible “anytime” and “anywhere”. But does that last etap-target fulfill the promises of a better …everything? Yes and no! Orientation points can be physically or mentally anchored. So besides the description of existing landmarks it is as well possible to coin a story with its stages and typical items as mental landmarks or models for orientation. An excellent antipole to the navigation system offered via google glasses is the navigation system “No Place Like Home” by the British designer Robert Wilcox. The shoes are a reference to Dorothy’s red shoes in the “Wizard of Oz”. The product comes along with a best known story, which not only glamorize the product but gives hints about use and role of the user. Although UX is not necessarily focused to the narrative quality of the experience, immersion is an proper method to authenticate it. This immersion can either be produced merely mentally by storytelling like it is well-known from movies. Another possibility is to involve the senses of users. 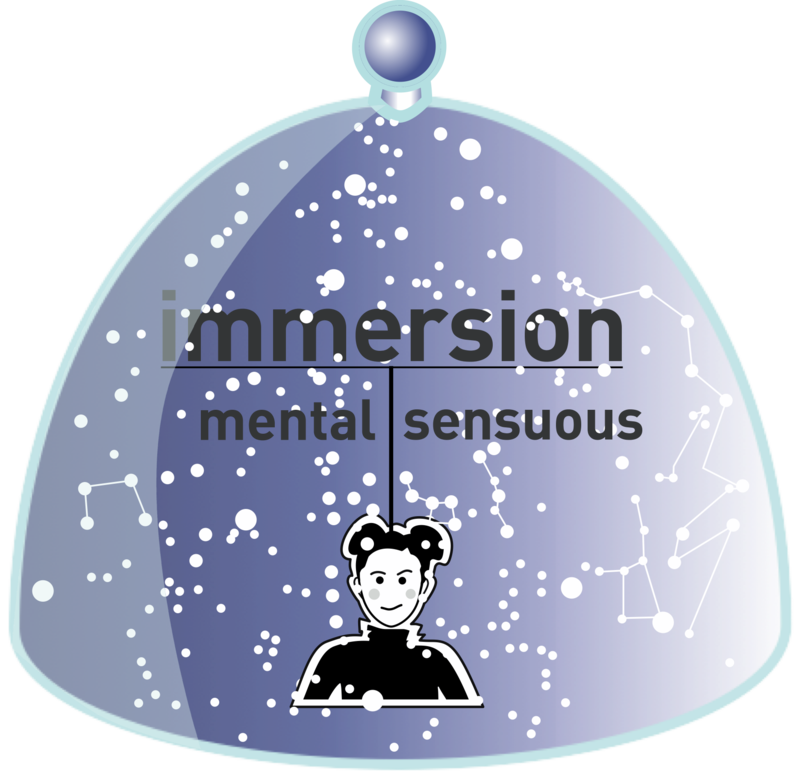 Immersion is not necessarily generated by mirroring extra information to our real life, like Google Glasses provide for. The following examples shall give some ideas how to stage user experience in ambient media. teamfunk is a semester project by Christoph Aumann, Lukas Geißler, Jan-André Huber, Philipp Pra, Christian Tamanini, Christoph Wannemacher, Stefan Zoll (winter term 09/10). At the beginning, please try to remember your last elevator situation. I bet the bottom line for most of you is that it was boring, a waste of time and unpleasant because of unwanted or to be avoided contact to other people. Yes, that is the ordinary elevator feeling. The student group xcf22 (please don’t ask, until today I don’t know the meaning of the name) thought about the revitalization of elevator spaces. The ambient elevator is a self-contained ambient world, similar to a space capsule, transporting vertical travelers within an office tower building. It offers moods, fitting to the time of day and personal information to each passenger. In the morning it supplies the individual with briefing information and hints to survive the day. In the early evening it cheers the passengers up in the stimulating club-mode. Ambient Elevator is an IMD semester project by Kathrin Armbrust, Philipp Burton, Christian Maximilian Franke, Fabian Häussler, Raoul Keller, Jan Müller (winter term 11/12). Imagine being a passionated jogger. Wouldn’t it be great if you just needed to step out of your flat, walk to your favorite running spot and then just start jogging, since your data will be tracked without the need for carrying any devices around? Lightrun is an ambient environment – let’s say in the English Garden of Munich. It recognizes the runner by the help of an RFID-Chip and leads him by light streams that are embedded besides the paths. According to the presets, the light-stream represents the speed of the joggers best run or the speed of a training partner. 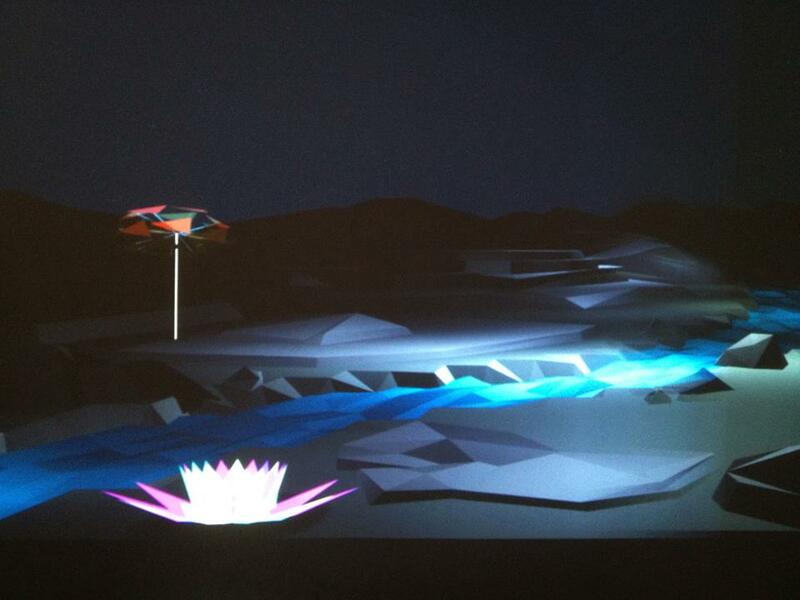 Lightrun is an IMD semester project by Max Brinkmann, Lars Möller, Melanie Neumann, Jan Rathkens (winter term 10/11). This project example, designed and developed as bachelor project by Johannes Lemke, among other things addresses the “digital interior” as an interesting coming up perspective in ambient media. It at the same time demonstrates the naturalness of interaction that connects the real and the virtual world. A wide wall projection shows an abstract landscape. A river flows across the land, leaves the wall and conquers the floor. The water with its stream of particles is the user interface between landscape and user. “Watering” the landscape with the particles lets the user create an own exotic garden. A Microsoft Kinect is used for tracking the people’s movements within the installation. When the interaction stops, plants will slowly wither. Referencing a natural setting helps users understand the interaction with the system. The visual setting is supported by a rich soundscape, helping to create an immersive experience. Gently flowing water is hearable. Each plant is associated with its own track in the soundscape. The more plants of a species there are, the louder the respective track is played. As there’s a visual contrast of the gloomy landscape to the vivid plants, their sounds are also more dynamical and bright, partly even rhythmic. growth is an IMD bachelor project by Johannes Lemke (2012). “floating about” is an outdoor game, taking place roaming through a city, that allows players to experience a connection between reality and a virtual world. The “bridge” builds a handheld projector that uncovers the virtual world behind the real lives’ walls like a torch light in the dark. This way ordinary city walls are being transformed into multidimensional screens that allow for a deeper level of immersion. In the beginning the parallel world appears dark and empty, but blooms and flourishes, when the players interact with it. To create the “world-behind-the-wall”-look, the designers realized a position tracking with Wii-Remotes, that allows, in combination with iPhone internal sensors, to move the game world in a way, that a perspective illusion of spatiality occurs. The alternate gaming experience depends on the location of the players. The virtual world is like a secret interpretation of the real one. (And – who knows – from another perspective, it might seem the true one?) Buildings from the real city are represented by elements in the virtual world. Like an invisible fog, a layer of location-dependent real Twitter messages is lying over the city and has to be revealed by the players. The messages are annotated as sad or happy ones. 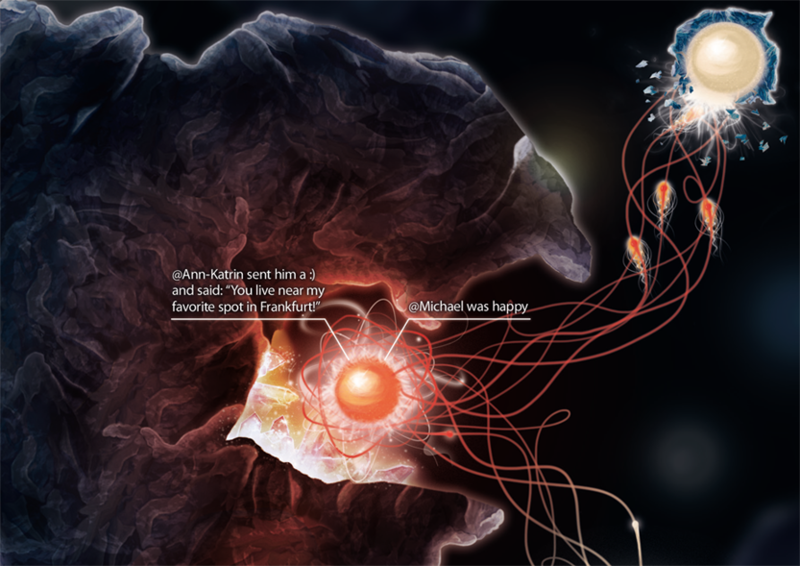 By generating own messages as answers to the existing ones the game can be influenced just in time by the players and becomes perceptible connected to reality. floating about is an IMD bachelor project of Michael Burk, Joris Klause, Ann-Katrin Krenz, Jan-Moritz Müller (2012). “Lichtung” is a concept for an ambient media lounge. Its visitors immerse in a fascinating magic world of cocoon-caves and an abstract forest. The world is populated by floating little light-creatures. These beings are attracted by humans and colour. Once a visitor sat down somewhere they draw near and begin to collect the dye of the visitors clothes or objects they brought along. The collected colors are released at the roots of surrounding trees, so their branches grow and brighten in luminous colors. The visitors are motivated to discover this world and think about new colored objects to supply the ecosystem with fresh hues. Thereby guests generate their own unique atmosphere. Lichtung is an IMD semester project by Michael Burk, Ricardo Gallego, Joris Klause, Ann-Katrin Krenz, Johannes Lemke, J. Moritz Müller, Markus Schuricht (winter term 11/12). Fig. 12, Extract of the gameworld of “floating about” from: Burk, M.; Klause, J.; Krenz, A.-K.; Müller, J.M. : floating about – project documentation, mediencampus der Hochschule Darmstadt, 2012, page 39.